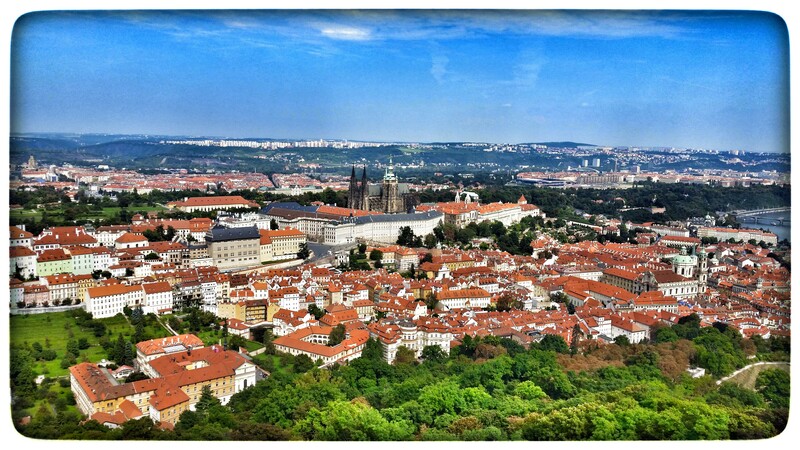 Our time in Prague is already nearly over! As I sit here (okay, so I may be laying in bed rather than sitting) writing this post, it’s hard to believe that we’re already moving onto our fourth city tomorrow and that we’ll be home at the end of this week. All the more reason to enjoy the memories we made in Prague and to look forward to Munich and Zurich! Onward and upward (very much upward, as you’ll read shortly) we went from lunch, heading towards Petrin Hill. Since we crossed the famous Charles Bridge yesterday, we opted to take the Legion Bridge today as it’s far less crowded and is closer to our apartment. 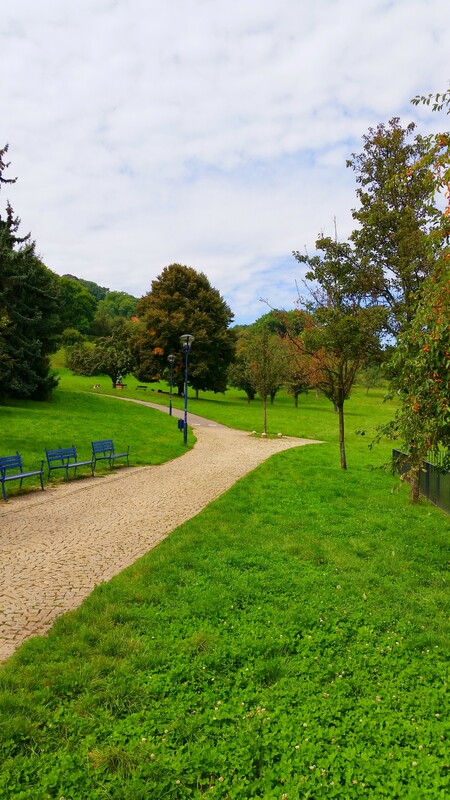 Once you cross the river, you just have to walk ahead for a short distance to reach the base of Petrin Hill. When you cross from the Legion Bridge, you’ll come upon the Memorial to the Victims of Communism at the base, which is worth a quick photo stop. 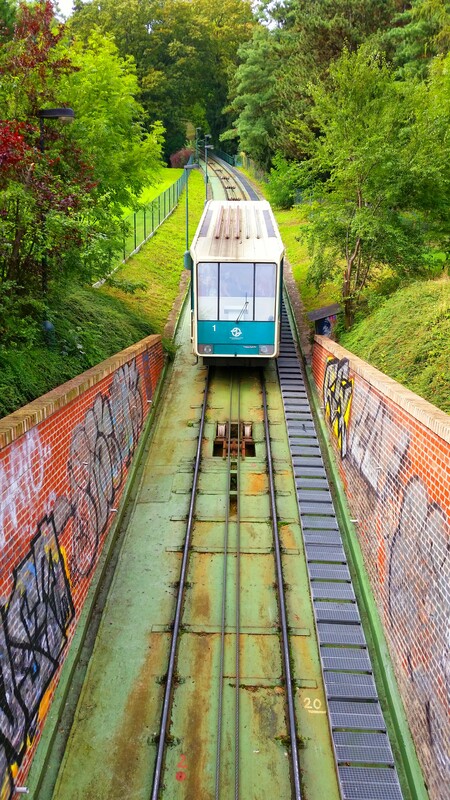 We were debating whether or not we wanted to take the funicular (the base of which is slightly north of the memorial) up to the top of the hill, but as we did in Budapest, we decided to hoof it on foot. Scott read something online that said it’s a “nice hike” to get to the top of the hill. A hike it may be, but nice it was not. :p To be fair, it wasn’t terrible, but it’s a steep, tall hill (nearly 1,050 feet), so the walk up this one was definitely more difficult than the walk up Castle Hill in Budapest. Still, if you can do it, I recommend it because you do get a nice peek at the city about halfway up and it’s a nice, green, tree-covered area to walk through. 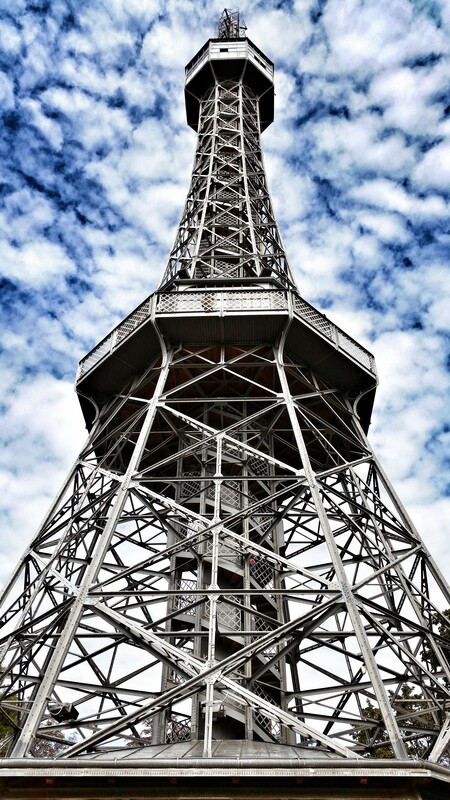 And at the top, you’re rewarded with the Petrin Observation Tower, which was built as a mini version of the Eiffel Tower in 1891 and is an awesome place to look out over Prague. Be warned that you can only use cash to pay the entry fee for the tower (120 CZK/$5.60 US or 180 CZK/$8.40 if you want to use the elevator to get to the top) and there aren’t any ATMs nearby (that we could see, anyway), so be sure you have cash before you make the climb (or the ride on the funicular). Luckily, we had just enough cash for us to get in and the views were amazing! There are 299 stairs to the top, but there’s a lower observation deck about halfway up that is just as good, if not better, than the upper one. The lower deck allows you to walk outside and is far less crowded, whereas the upper deck is closed in with lots of windows to allow you to see the views and is really crowded. I made the climb all the way to the top just to say I did it, but I immediately went back down to the lower deck. On a clear, sunny day like today, the views were excellent, so I’m so glad we made the decision to go up there (even if it did mean walking all the way up the hill to reach the tower :)). What goes up must come down, so the journey up the hill was followed by the trek back down, albeit via a different path so we could come out closer to our next destination, Prague Castle. 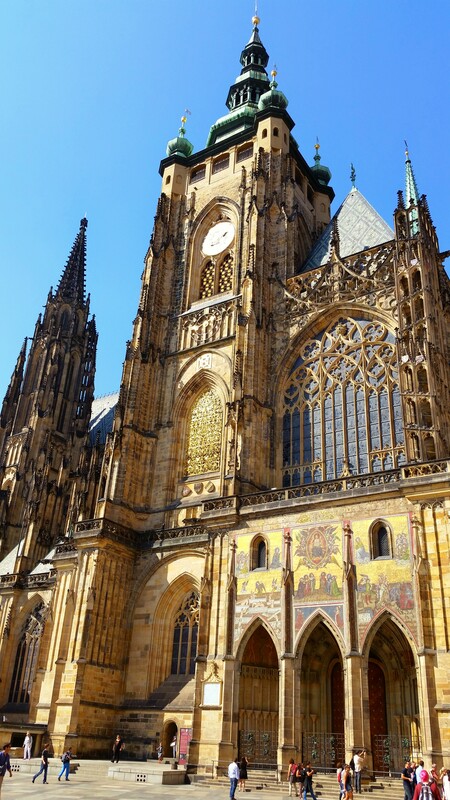 Interestingly, the landmark that we thought was the castle was actually St. Vitus Cathedral, which is essentially attached to the castle, so it still worked as a landmark. Although the castle is the “largest coherent castle complex in the world”, it doesn’t feel like a big castle, say like Windsor Castle or Neuschwanstein Castle (which we’re seeing in Munich this week!). 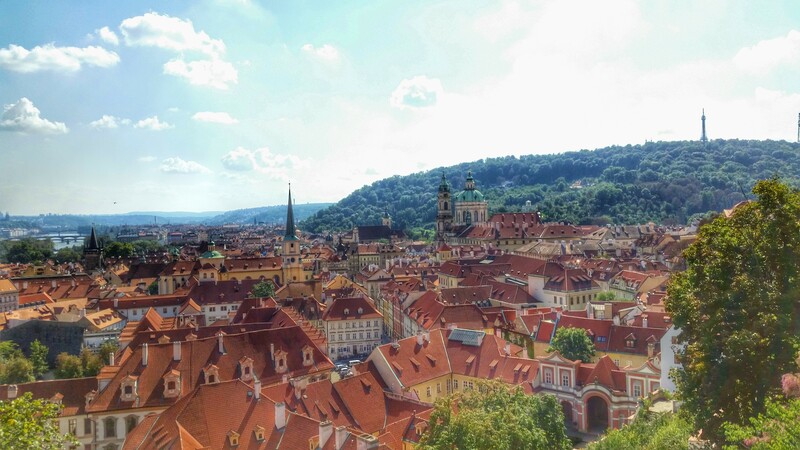 Still, it should be part of your list of things to see in Prague. We didn’t go into the castle because we had read online that some of the most beautiful parts of it don’t require tickets anyway. 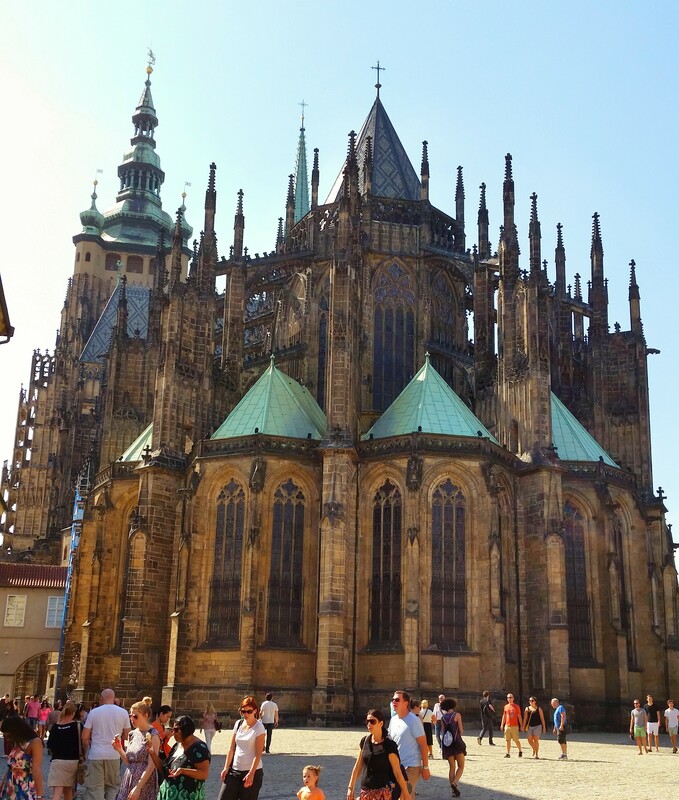 Your mileage may vary, but getting to see some of the grounds (and the views from them) as well as being able to at least step into St. Vitus Cathedral (you need a ticket to get more than about 100 feet in) was great for us. If you do want to go into more of the spaces, be sure to check out the different ticket options as there are different entry levels for different tickets, based on what sights are included. After walking up and down that big hill and seeing what we could of the castle complex, we headed home to rest up and figure out the rest of our day. Check out the pictures below! Lunch! 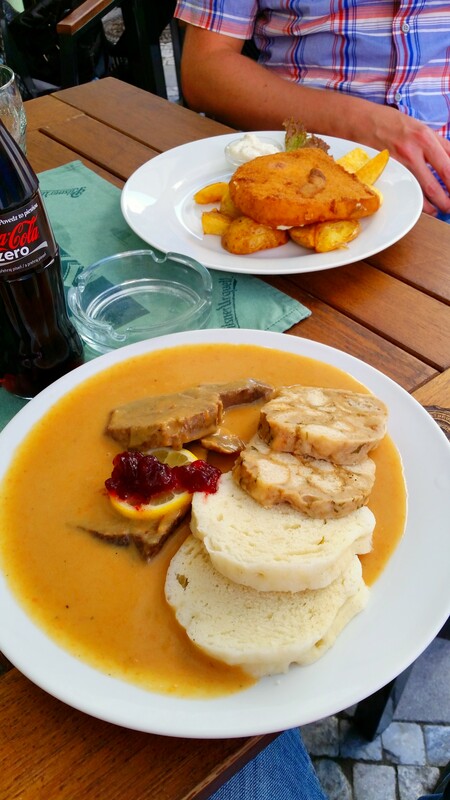 I know the gravy looks a bit soupy, but it was actually pretty thick and it was super tasty. A view of the Charles Bridge and Prague from the Legion Bridge. A bit more of the view with a nice panorama. 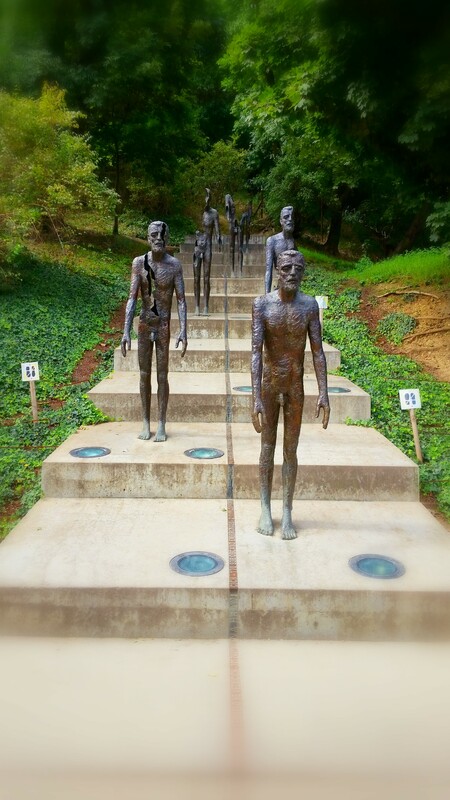 The Memorial to the Victims of Communism. 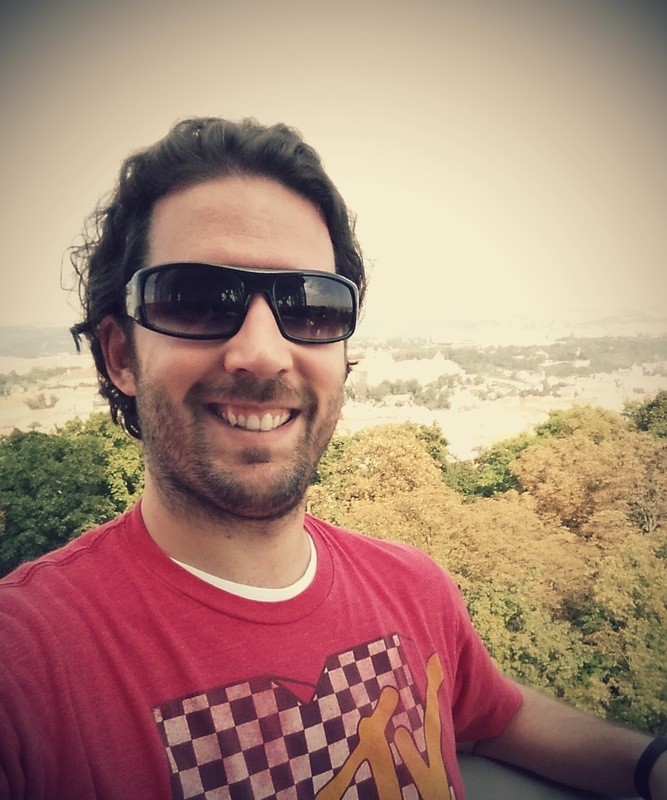 The start of our long walk up Petrin Hill. 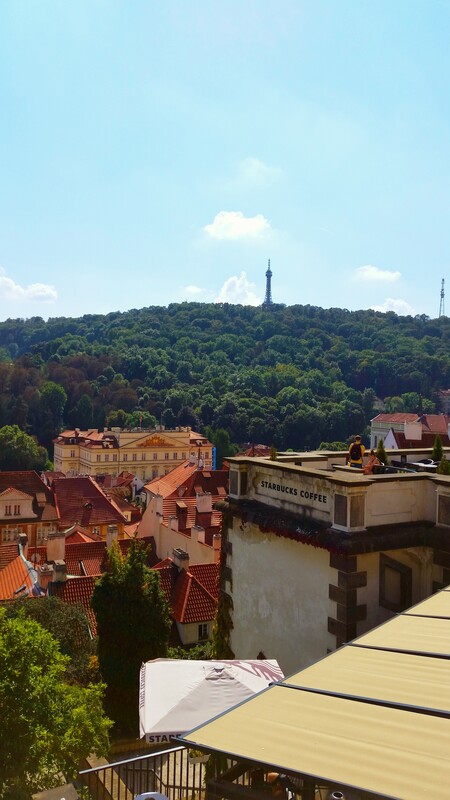 The reward at the end of our climb – Petrin Observation Tower. Great views from the tower! Look Ma, I walked all the way up! 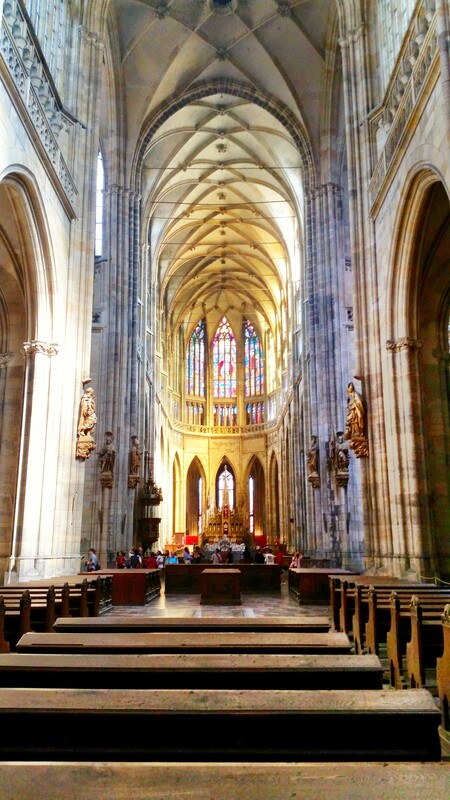 The amazing-looking St. Vitus Cathedral. The inside is just as beautiful as the outside. 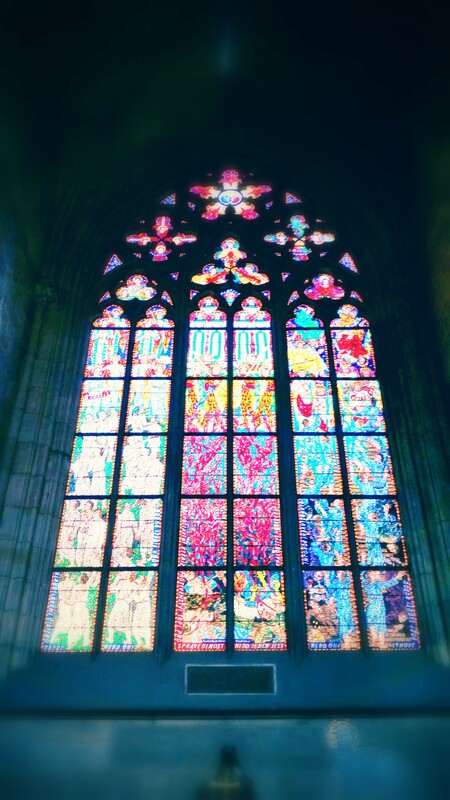 Love a good stained glass window. I snapped this one after we left the cathedral. One last view of this amazing city before we walked back to our apartment. And with that, we pretty much put a bow on our time in Prague. We picked a great-looking Italian place for dinner, but when we got there, there was a sign on the door saying it was closed today for some reason. Oh well! We walked a little ways down the street to find a great place though, so it worked out. We’re pretty well packed up and will be off to bed soon. We’re catching a bus to Munich at 1015a tomorrow for the next part of our adventure. Germany, here we come (again)!